These Cornbread Muffins are made with creamed corn so they truly taste of corn and are more moist than traditional Southern cornbread. A terrific side and great for snacking, these corn muffins keep for days. THESE are the muffins I make over and over and over again! 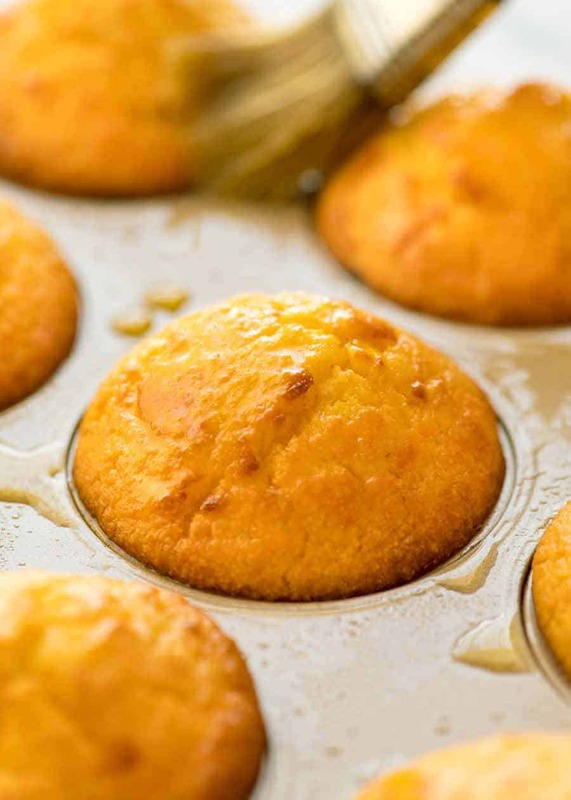 This Cornbread Muffin recipe was originally published in October 2014. Recipe slightly improved, rewrote post, new photos, recipe video added – it’s a total refresh! While many people associate cornbread as a Southern staple, there’s actually two distinct types of cornbread in the States – Southern and Northern style cornbread. Cornbread from the South is typically (and I use that word loosely!) more crumbly and less sweet, made with just cornmeal, no flour (or very little flour). It doesn’t keep well and is best served with saucy things to dunk it into (Baked Beans Chili), or plenty of butter. Northern Style cornbread is more cake like, owing to the addition of flour. The crumb is more tender, it’s springy, it doesn’t crumble and it’s usually sweeter. 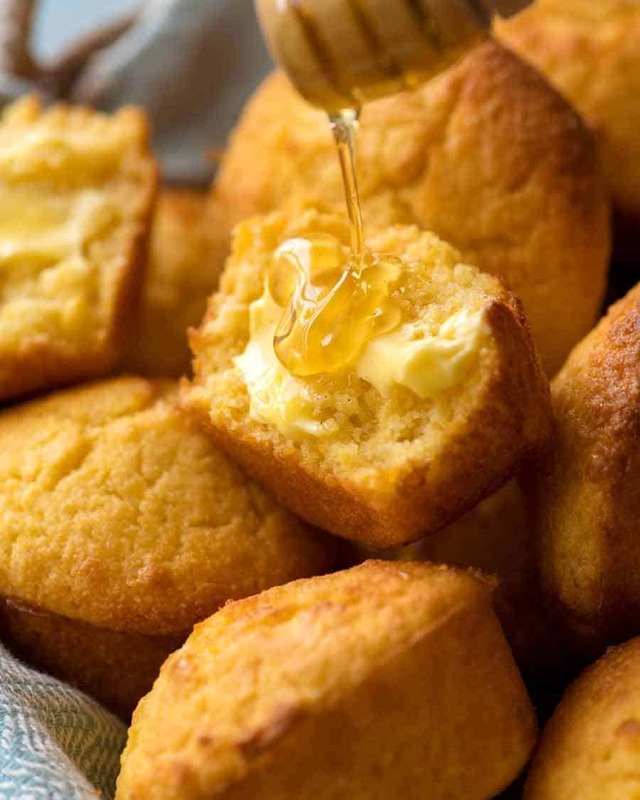 This Cornbread Muffin recipe is a Northern style cornbread. Except I’ve adapted it to my taste with the addition of creamed corn which you don’t usually find in either Southern or Northern cornbread. Stronger corn flavour, and makes it moister! It feels unnatural to say that cans of creamed corn are a staple in my pantry. 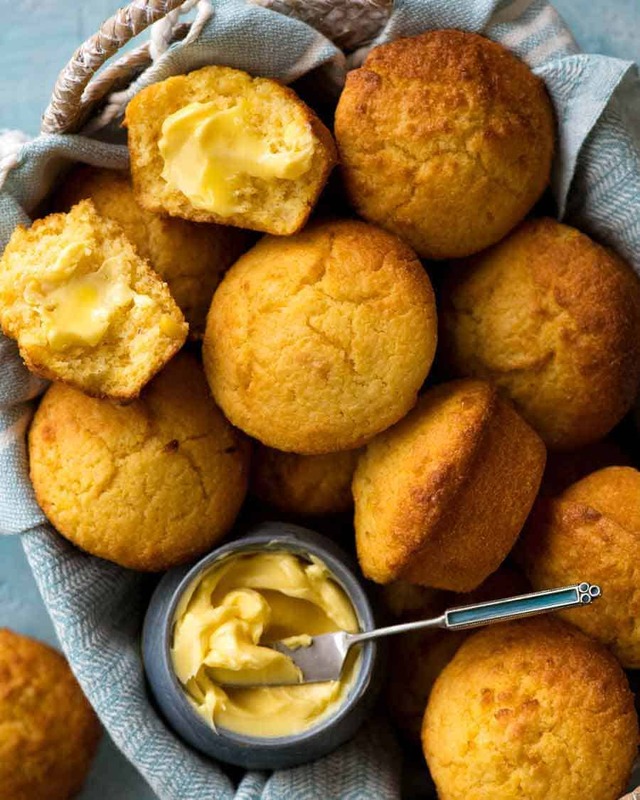 But they are – and it’s because of these cornbread muffins (and this 15 minute Chinese Corn Soup!). I make these Cornbread Muffins ALOT. These are the muffins I take to BBQ’s when I’m asked to bring a side (or if I’m told not to bring anything at all ). These are the muffins I can make as a side dish for a midweek dinner because they are terrifically quick to mix up. 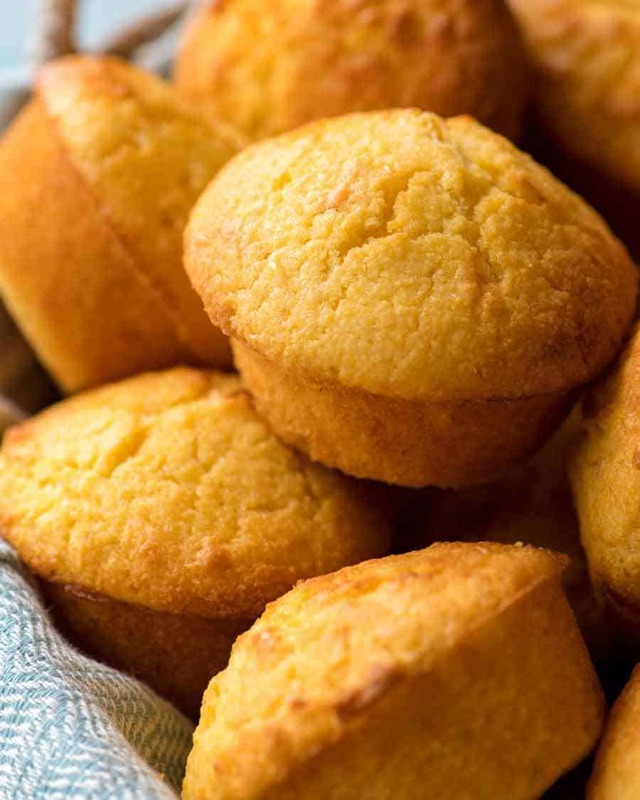 The key ingredient in Cornbread Muffins is yellow cornmeal. Cornmeal is ground dried corn kernels – it comes in fine, medium and coarse ground. Confusingly, cornmeal is labelled as polenta here in Australia. But actually, polenta is a porridge like Italian side dish (their mashed potato!) that is made from cornmeal. All you need to remember is this: If you’re in Australia, buy the yellow ground stuff labelled polenta. That’s cornmeal! With these Cornbread Muffins being one of my personal favourite recipes and give that patience is not one of my greatest virtues, I first shared this recipe back when I started this website in 2014. I’ve been looking forward to updating this post with new photos and more importantly, adding a recipe video! 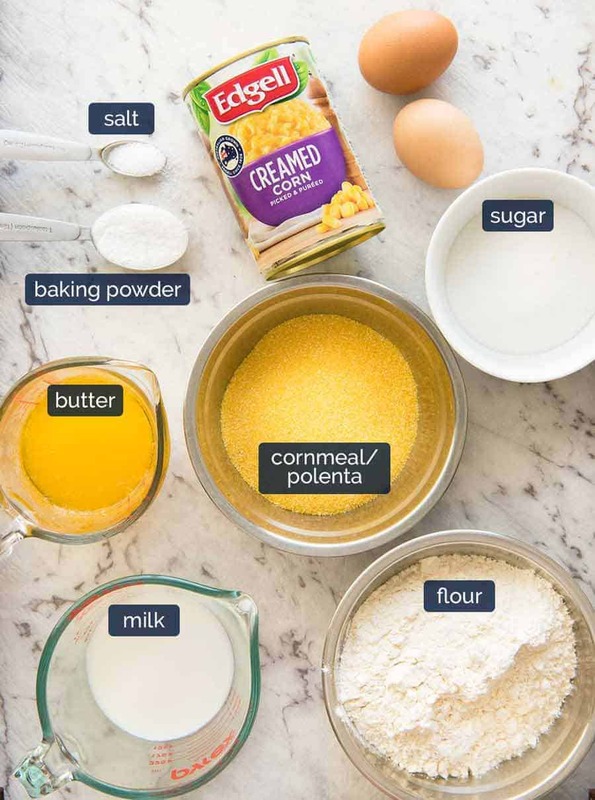 TRY THESE CORN BREAD MUFFINS WITH…. Recipe video above. These muffins are so tasty and moist that you don’t even need butter for them, just eat them plain! I especially like to serve these as a side to Chili Con Carne, and of course they make an appearance for any Southern meals I make! Can also be made in a skillet. Preheat oven to 180C/350F. 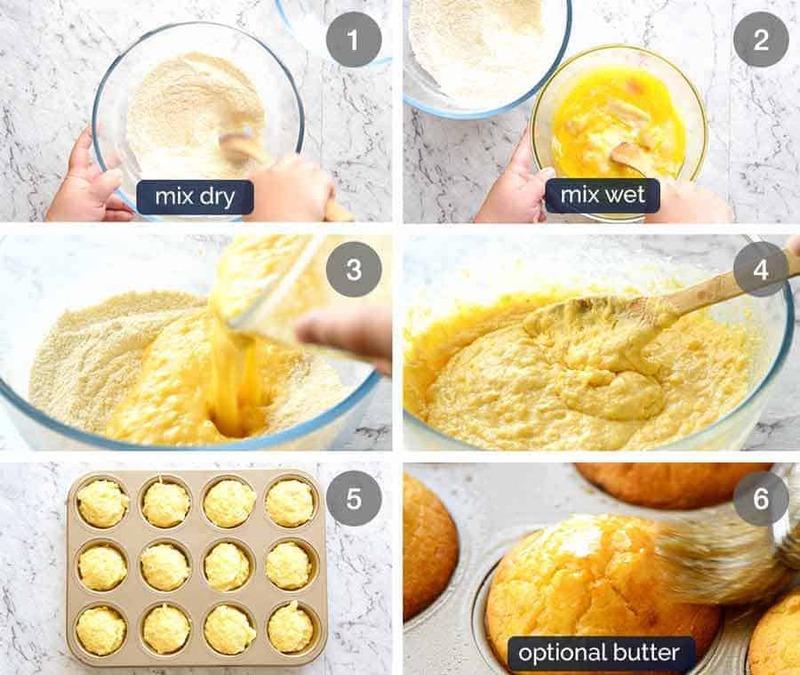 Brush a 12 hole standard muffin tin with melted butter. Combine Dry ingredients in a bowl and give them a quick stir to combine. Whisk Wet ingredients in a bowl until combined. Pour Wet into Dry ingredients. Mix until combined. Spoon the batter into the greased muffin tray – use it all up, fill the holes right up! Bake in the oven for 20 minutes or until the top is golden brown. Remove muffin tray from the oven. Optional: Brush tops with melted butter. Cool for 5 minutes then remove muffins onto a rack. 1. Cornmeal (polenta): In Australia, cornmeal is labelled as “polenta” in most supermarkets. Polenta is a porridge-like side dish that has a consistency like a very loose creamy mashed potato. It is to Italians what Mashed Potato is to other countries. Polenta is made from cornmeal which is ground corn. 2. Flour – Can sub flour + baking powder with self raising flour. 3. STORING: These keep well for a 3 to 4 days in an airtight container. They are always best served warm with butter and honey, or something for dunking! 4. WHAT THEY TASTE LIKE: Moist with a muffin like texture with a lovely corn flavour. A bit sweet (2 tsp sugar in each muffin) but not overly sweet (can reduce sugar) with a bit of gritty texture from the cornmeal which is a nice reminder that it’s there. I am utterly in love with these Cornbread Muffins! 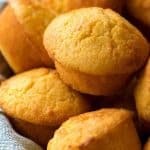 The post Cornbread Muffins appeared first on RecipeTin Eats.